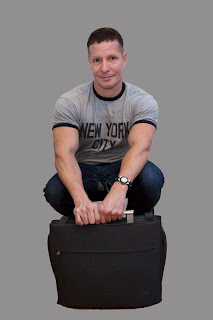 I am one of the subjects of BAG a great and interesting project that Philadelphia Photographer Ellie Brown and New Yorker Performance Artist, Camille Thoman created. Please read more about it and go their site to see more about the project. It is a great one! Photographer Ellie Brown and filmmaker/performance artist Camille Thoman are collaborating on the project BAG. BAG is photographic installation exploring the duality between the way people characterize themselves in public and the private contents of their handbags. This is depicted by a photograph of the subject against a neutral background, in their everyday clothes, with their bag, purse, briefcase or any other container they carry on a daily basis. The portrait of their public face is juxtaposed with the person’s more private self, represented by the actual contents of their bag. 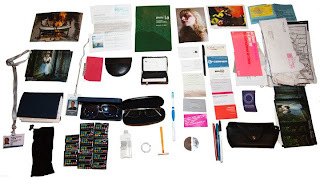 BAG allows the viewer a glimpse into the private world of another individual, revealing aspects of this person’s organizational habits, vanities, occupations and preoccupations. This is a personal and voyeuristic look at the possessions a person carries in their bag, which has been gifted to the viewer by the subject as a willing participant. It is the tension between the person and what they are attached to that constitutes the main point of interest in BAG. What do people choose to hold onto? What are the materials they feel they need to carry around with them? What is the correlation between how the subjects choose to portray themselves in the world, and the story that is conveyed to us by their intimate objects? Furthermore, what is the story of the objects themselves? Some are sentimental, materially valuable, some are part of a current of shared objects that pass unwittingly from person to person--—pens, flyers, elastic bands. How many things are in our bag now that we are unaware of, that have been passed to us and that we will pass on, never cognizant of when they appeared and disappeared from our lives? What are the objects in people’s bags that they are sufficiently attached to in the present to physically carry with them, but will be lost or unaccounted for in a few months time? BAG consists of a series of 20-40 large-scale portraits taken in Philadelphia, Los Angeles and New York. Each portrait contains three separate elements. Element 1: A photograph of the subject with their bag/purse/knapsack/briefcase. This image will exhibit how the subject chooses to normally present him or herself to the outside world, holding their bag. Element 2: The actual contents of their bag/purse/knapsack/briefcase displayed on a shelf. We will ask each person for all items in their bag except the contents of their wallet and their keys. Aside from these items, each subject will be asked to part with everything else for the duration of the exhibition. We will catalogue all items and keep track of those the subject refuses to part with or has lost by the time the exhibit is mounted. During the exhibition, photographs will represent those artifacts that the person chooses to keep or no longer has. Element 3: Three typed inventories alongside the photograph of the bag’s contents. Though they are asked to part with their belongings, it will be up to each person to accept or refuse the request. Thus the contents of the BAG will be inventoried in three ways. (A) The items in the bag the subject parts with immediately at the time their photo is taken, and for an indefinite period of time, (B) Items in the bag that the subject will part with for the duration of the exhibition only, (possibly months away) and (C) Items in the bag the subject refuses to part with at all for any period of time. Also highlighted in the exhibit will be those items the subject allowed us to use for the exhibit, but can no longer be found or accounted for by the time the exhibit opens. We are interested in portraits across age, socio-economic, gender, and race lines. We are interested in finding out what is in children’s knapsacks and what they cannot bear to part with. We are interested in what very old people carry around with them. We are interested in why people carry what they carry and how that changes among different populations. We are also interested in the ways objects are unwittingly passed between people, float in and out of people’s bag and of their lives. This project takes an anthropological and sociological approach to the notion of exploring peoples attachments and habits, as signified by the microcosm of what is in their BAG.